The University, as it passed through the bracing times of the sixties, became increasingly egalitarian and pluralistic. 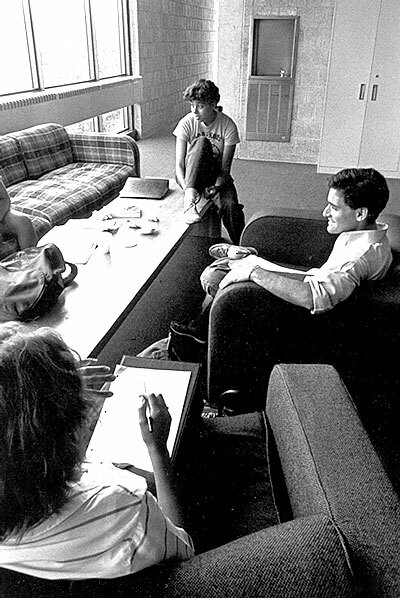 The University had become increasingly diverse as its undergraduate student body expanded. Along with more emphasis on intellectual consideration, Dean Owens had mentioned diversity of the student body as a priority. Thereafter, the number of women enrolled in the Arts and Sciences program sky-rocketed reaching parity with male enrollment. Between 1960-1961 registration in the women’s college rose from 774 to 1280; 65% more women were admitted in 1961 than in 1960. In 1969, Penn announced a plan to admit one-hundred more women in 1970 to even out the gender balance further. It was no accident that in that same year, Penn introduced a housing plan contrived in 1965, that helped achieve the balancing of the sexes. Alongside the housing plan, “need-blind” admissions, allowed the University to create a more racially and economically diverse community. “Need-blind” meant that Penn would accept a candidate by examination of his or her high-school record, resume, and qualifying statistics without regard to the financial situation of the applicant. This would ensure a fair assessment without consideration of ability to pay college costs. Simultaneously, it made admissions process far more competitive by increasing the number of capable students who could be accepted. In 1964, Penn sponsored a needy student “Talent Search,” called “Cooperative Program for Educational Opportunity,” which especially encouraged academically talented African Americans from area schools, such as West Philadelphia to apply. The program itself, was a product of the “Talent Searching Program,” inaugurated in 1962 by the whole Ivy League, which encouraged students of less fortunate economic backgrounds to apply to an excellent college. Through this program, the University sought gifted students from poor economic background and awarded major aid for each accepted. But it was not until the academic year 1965-66 that the University of Pennsylvania (as stated in the Annual Report of the University), “for the first time, could meet the needs of all entering students; it was also the year in which students could receive financial assistance but little personal attention from the Student Financial Aid Office.” After the beginning of official “need-blind” admissions (although not under that title), it was not until 1967 that the university eliminated residual “inequities” that had dogged the preliminary financial aid program. Financial Aid for the class of 1971 no longer had to rely on students loans, “that often placed a heavy burden on the students from the most precarious economic backgrounds.” This was a major program which benefited both parties– the students with an education which was otherwise unfeasible financially, and the university acquired talented and motivated young scholars who provided the proper supplementary numbers for the Admission department’s image project. By 1968, 47.6% of the 6,700 matriculants in all undergraduate departments received financial aid and 50% of graduate and professional students had been proffered aid by the University. Penn had become more available to the excellent student with modest financial means, while at the same time, less available to the mediocre student of high economic standing. This shift was undoubtedly served to improve the intellectual and cultural status of the University.